Many of us are familiar with the nervous and scared behavior that deer possess. When they see you, they freeze, and then freak – sprinting off as fast as possible. So it’s extremely rare for a deer to not only get very close to someone’s property, but actually decide to lie down and hang out for a while. Such was the case with this strange deer who made it’s way onto the property and right up onto the family’s deck. Then, she plopped right on down to the dog bed! Now you would think the family dog would be freaking out at this point, but instead the dog lies right down next to her! The cat then enters the picture and the deer decides to check it out, sniffing and greeting the feline. Too much! 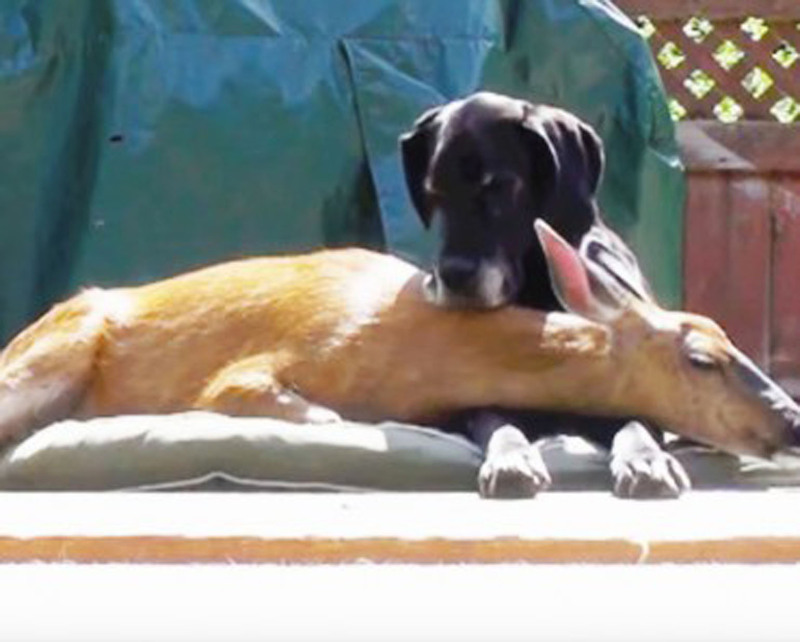 It doesn’t end there though as the deer gets hand fed by the owner and then the dog and deer end up running around and actually playing with one another. The deer’s sister decides to join in as well. Playtime ends and cuddle time begins. They both cuddle together on the dog bed! Really crazy that these two get along so well and can have such fun together. Share this true rarity with friends and family!